Cheers everyone! I'm back again, and unfortunately this post will be shorter than my usual ones. I've been trying a lot of things lately and I can say that it's a good investment charged to my experiences. As you see, information is not knowledge; experience is. When we get older, the list of things that are possible to do will get shorter and shorter. The best time to do whatever you've been wanting to do is now. A picture can capture those experiences and will give you a glimpse of the past, while a video is the closest thing you'll get from time travelling. 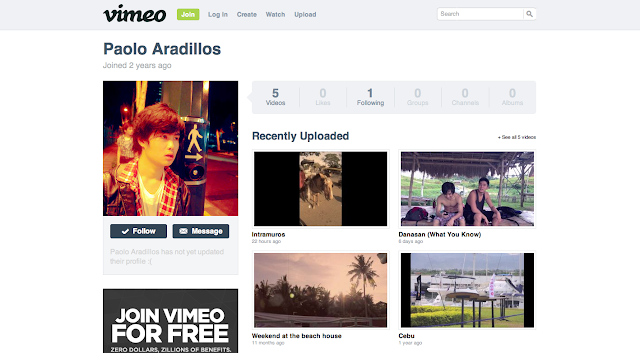 This post will mainly show you a link to my vimeo page. I am still learning to create better videos and I hope that this will continue. Please view my videos, and let me know what you think. Thank You!